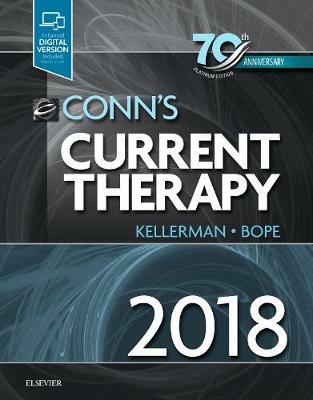 Designed for busy primary care specialists and other first-line care providers, Conn's Current Therapy 2018, by Drs. Edward T. Bope and Rick D. Kellerman, delivers up-to-date treatment information in a concise yet in-depth format. Recognized leaders in the field provide their personal approaches and evidence-based clinical management options for the conditions you're most likely to see in your everyday practice. Focuses on the most current diagnosis and treatment protocols for common complaints, acute diseases, and chronic illnesses - more than 300 topics, all carefully reviewed and updated. "The quality, depth and width of material is excellent." 1 Not FDA approved for this indication. 2 Not available in the United States. 3 Exceeds dosage recommended by the manufacturer. 4 Not yet approved for use in the United States. 5 Investigational drug in the United States. 6 May be compounded by pharmacists. 7 Available as dietary supplement. 8 Orphan drug in the United States. 9 Available as homeopathic remedy. 10 Available in the United States from the Centers for Disease Control and Prevention.